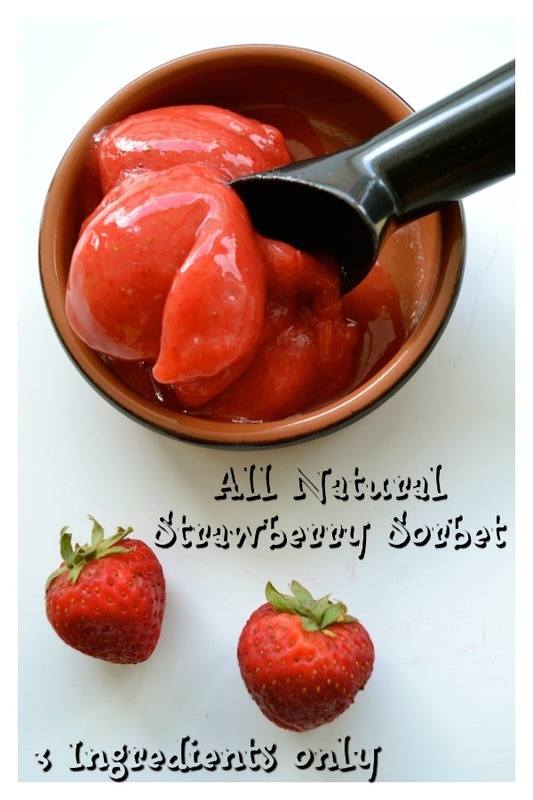 All natural 3 Ingredient Strawberry Sorbet. The perfect healthy treat for a hot summer day. Easy to make, refreshing and full or natural strawberry flavor! Summer has officially arrived! It is hot, humid, and we are all craving cold treats like my Natural 3 Ingredient Strawberry Sorbet. So refreshing and perfect to cool you down. This summer I am determined to give my family homemade treats. Less store-bought desserts and more homemade recipes made with fresh ingredients. I love sweet and delicious treats substituting refined sugars for natural ones. This time I made my Natural 3 Ingredient Strawberry Sorbet with maple syrup. Let me just say it tastes better than store-bought sorbet. You can really taste the freshness of the fruit: creamy, refreshing, sweet, rich, natural strawberry tasting sorbet. Adding maple syrup made the texture very creamy, like ice-cream. 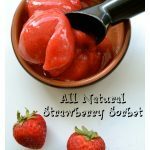 You need to try this Natural 3 Ingredient Strawberry Sorbet if you want to enjoy a delicious and healthy dessert. I used fresh organic strawberries, grade A maple syrup and the juice from 1/2 a lime. That’s it! 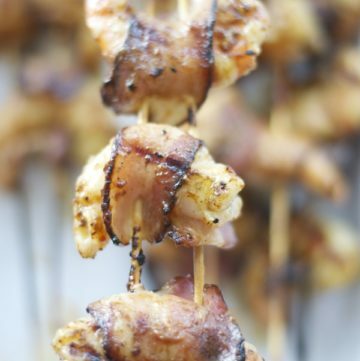 More and more I am finding out that the most delicious recipes are the easiest and simplest ones. You only need good quality ingredients and you can enjoy wonderful treats. 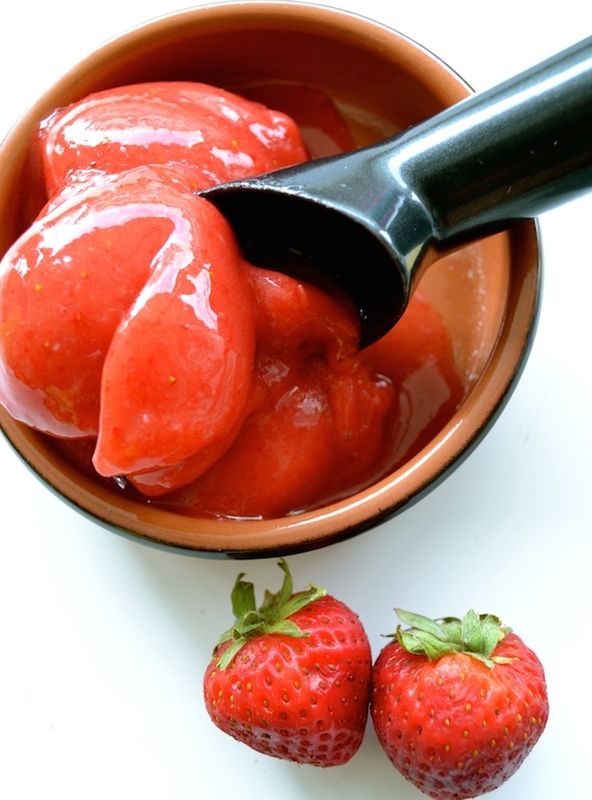 This Natural 3 Ingredient Strawberry Sorbet is perfect for the summer. 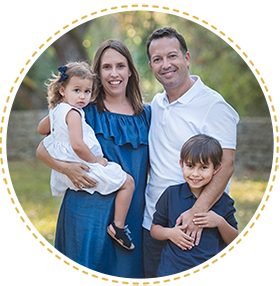 My family loved it and most importantly, I am not adding more refined sugar to their diets. If you look at the pictures you can see my sorbet is starting to melt a little. My family just couldn’t wait and had to eat it. After making the sorbet, put it back in the freezer for a couple of hours for the ideal texture. I had some the following day and it was just perfect. It will not turn icy like other sorbet recipes I have tried in the past. The trick was to add enough maple syrup and the texture came out perfect. If you want to try more creative and healthy strawberry recipes, please see Homemade Strawberry Applesauce. It feels great to know you are contributing to the health of your family by making homemade healthy food. Perfect healthy and creative treat for the summer. Wash, remove stems and cut strawberries in half. 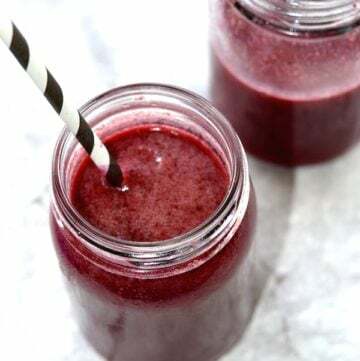 Blend the frozen strawberries in a high speed blender with maple syrup and the juice of 1/2 a lime. Add a little water to make sure everything is well combined. I added about 1/2 cup of water. You can add little by little until you get the right consistency. You can serve it right away or freeze for an additional 2-3 hours for a more frozen texture. Hi there! I’m super interested in the ease of this recipe, but I was wondering if I could replace the maple syrup with agave nectar or honey? Thanks! Hi Jordan. Yes, you can replace it with honey or agave nectar. I’ve made this recipe with honey too. 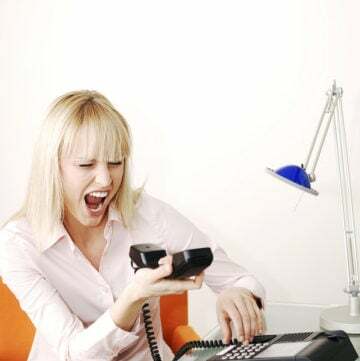 Will work!